"The potential for using this method to investigate the calorie content of walnuts is intriguing," says David J. Baer, PhD, supervisory research physiologist in the Food Components and Health Laboratory at the USDA's Agricultural Research Service. "Given the potential health benefits of consuming walnuts, including the reduced risk for cardiovascular disease, it's worthwhile to understand the calorie content of walnuts in the human diet and potentially reduce the barriers to their consumption." Even though nut consumption is associated with a healthy BMI, nuts and seeds are energy dense, so patients should be mindful of portion sizes. While the number of nuts per serving varies by type, a typical serving is 1 oz or about 1/4 cup or a small handful (palm of the hand only). Chere Bork, MS, RDN, owner of Savor Your Life Today, Inc (cherebork.com), keeps a 1/4-cup measure by her bag of nuts. Maggie Moon, MS, RDN, author of The Elimination Diet Workbook, keeps measured snack packs of almonds and pistachios in her desk, gym bag, and purse "so that I always have a healthful snack on hand." "I encourage my patients to try a new nut or seed toasted, such as pepitas (pumpkin seeds) or hazelnuts to add to salads, oatmeal, pilafs, quinoa, or other ancient grain dishes," says Judy Simon, MS, RDN, CD, CHES, of Mind Body Nutrition, PLLC in Bellevue, Washington. "They add a nice flavor, texture, and big nutrition boost of nutrition." Oakland, California-based Jessica Jones, MS, RD, founder of Jessica Jones Nutrition (jessicajonesnutrition.com), says her favorite place to get a dose of nuts and seeds is in a morning smoothie. "Every morning I toss in a spoonful of pumpkin seeds, hemp seeds, and chia seeds to boost my protein, fiber, and omega-3 intake." 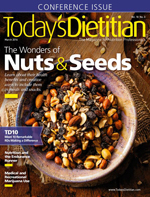 Robin Plotkin, RD, LD, the Dallas-based cofounder of blogbrulee.com and CEO and founder of RobinsBite, Inc, points out that nuts and seeds always have a place in a DIY trail mix recipe. "Along with your standard ingredients, toss in pumpkin seeds, sunflower seeds, or flaxseeds—and/or chopped almonds, pistachios, walnuts, or pecans," she says. "Or, if using a prepared trail mix or granola that doesn't include nuts or seeds, add in a tablespoon of your favorite for extra crunch and added nutrition." • Almonds are high in monounsaturated fats, which may explain their association with lower LDL cholesterol levels and reduced heart disease risk. The antioxidant function of the vitamin E (37% DV in 1 oz) in almonds along with their magnesium and potassium also may play a role in cardiovascular health. One study found that almonds may reduce LDL as much as statins.17 "For my chocolate lovers, I recommend mixing a tablespoon of almonds with a tablespoon or two of dark chocolate chips for a satisfying, crunchy snack," Jones says. • Chia, flax, and hemp seeds: Flaxseeds are an excellent source of the plant-based omega-3 alpha-linolenic acid, but chia seeds are close rivals. Chia seeds win for fiber content (10 g per oz), while hemp wins for protein (9 g per oz). Chia seeds contain respectable amounts of calcium and other minerals important for bone health, as well as several antioxidants. Numerous studies have suggested that flaxseeds have cardiovascular benefits and possibly cancer-preventive effects.21,22 Ground flaxseeds are more digestible than whole, but they have a short shelf life, about six to 16 weeks in the refrigerator or longer term in the freezer. For maximum freshness, buy whole flaxseeds and grind as needed in a clean coffee grinder. Connecticut-based nutrition consultant Beth Rosen, MS, RD, CDN, owner of Goodness Gracious Living (goodnessgraciousliving.com), refuels with homemade energy bites: "In a bowl, combine 1 cup oats, 1/2 cup unsweetened peanut butter, 1/4 cup chia seeds, 1/4 cup ground flaxseeds, 1/4 cup chopped dried cherries (or your favorite add-in), and 1/3 cup pure maple syrup. Use a tablespoon of the mixture and roll into balls, placing them on a cookie sheet. Freeze for an hour and store either in the freezer or refrigerator for an easy, on-the-run snack powered by nuts and seeds." • Peanuts: Technically a legume, peanuts pack more protein per ounce than tree nuts. New Jersey-based Lauren Harris-Pincus, MS, RDN, owner of Nutrition Starring You (nutritionstarringyou.com), touts the particular benefits of powdered peanut butter, also sold as peanut flour. "With only 45 calories per two-tablespoon serving, you get 5 g of plant-based protein for about one-fourth of the calories of regular peanut butter. Stir it into oatmeal, yogurt, overnight oats, smoothies, protein shakes, muffin batter, salad dressings, and marinades, or mix it with water to create a dip for apples." • Pistachios: Two studies have shown that eating in-shell pistachios enhances feelings of fullness and satisfaction while reducing caloric intake. When eating in-shell pistachios, study subjects consumed about 40% fewer calories compared with pistachio kernels.26,27 Pistachios have the second highest polyphenol and flavonoid content of the tree nuts.25 Bork likes to toast them and toss them on curries. • Pumpkin seeds contain small amounts of several forms of vitamin E, and research suggests there's a health benefit to consuming vitamin E in all of its different forms.24 They also contain a unique blend of other antioxidant nutrients. • Sunflower seeds are rich in the powerful antioxidant pair vitamin E and selenium. A 1-oz serving alone contains almost one-half the DV of vitamin E. They're noteworthy for their phytosterol, protein, and fiber content. Carolyn Zisman, MS, RDN, a dietitian at Lockheed Martin Corporation in Bethesda, Maryland, says she adds sunflower seeds to many dishes. "They add a nice nutty flavor, lovely crunch, protein, and wealth of nutrients." She says she enjoys throwing sunflower seeds on slaw salads with oil and vinegar, on spaghetti squash with coconut oil and seasoning, on spiralized zucchini with oil and grape tomatoes, and on oatmeal. Baked ahead of time, these nutrition-packed walnut trail bars are the perfect snack for long trips, hikes, or even commutes to work. To reduce the sugar content and calories, omit the chocolate chips. 1. Preheat oven to 325° F. In bowl, whisk together oats, brown sugar, flour, baking soda, and cinnamon. Stir in walnuts, cherries, chocolate chips, pumpkin seeds, coconut, and sesame seeds; set aside. 2. In food processor, process apricots until broken up, about one minute. Add butter and process until a paste forms, about one minute. With motor running, pour in honey until well blended. Fold into oat mixture until well combined. Pat evenly into a parchment-lined 9 X 13-in baking pan. 3. Bake in the center of oven until golden, about 30 minutes. Transfer to rack to cool completely. 4. Cut into bars (2 X 12 rows or 8 X 3 rows). — Recipe courtesy of The California Walnut Board. 1. Bao Y, Han J, Hu FB, et al. Association of nut consumption with total and cause-specific mortality. N Engl J Med. 2013;369(21):2001-2011. 2. Ros E. Health benefits of nut consumption. Nutrients. 2010;2(7):652-682. 3. Estruch R, Ros E, Salas-Salvadó J, et al. Primary prevention of cardiovascular disease with a Mediterranean diet. N Engl J Med. 2013;368(14):1279-1290. 4. Guasch-Ferré M, Bulló M, Martínez-González MÁ, et al. Frequency of nut consumption and mortality risk in the PREDIMED nutrition intervention trial. BMC Med. 2013;11:164. 5. Hshieh TT, Petrone AB, Gaziano JM, Djoussé L. Nut consumption and risk of mortality in the Physicians' Health Study. Am J Clin Nutr. 2015;101(2):407-412. 6. Gopinath B, Flood VM, Burlutsky G, Mitchell P. Consumption of nuts and risk of total and cause-specific mortality over 15 years. Nutr Metab Cardiovas Dis. 2015;25(12):1125-1131. 7. Luu HN, Blot WJ, Xiang YB, et al. Prospective evaluation of the association of nut/peanut consumption with total and cause-specific mortality. JAMA Intern Med. 2015;175(5):755-766. 8. Zhou D, Yu H, He F, et al. Nut consumption in relation to cardiovascular disease risk and type 2 diabetes: a systematic review and meta-analysis of prospective studies. Am J Clin Nutr. 2014;100(1):270-277. 9. Guo K, Zhou Z, Jiang Y, Li W, Li Y. Meta-analysis of prospective studies on the effects of nut consumption on hypertension and type 2 diabetes mellitus. J Diabetes. 2015;7(2):202-212. 10. Luo C, Zhang Y, Ding Y, et al. Nut consumption and risk of type 2 diabetes, cardiovascular disease, and all-cause mortality: a systematic review and meta-analysis. Am J Clin Nutr. 2014;100(1):256-269. 11. Grosso G, Yang J, Marventano S, Micek A, Galvano F, Kales SN. Nut consumption on all-cause, cardiovascular, and cancer mortality risk: a systematic review and meta-analysis of epidemiologic studies. Am J Clin Nutr. 2015;101(4):783-793. 12. Qualified health claims: letter of enforcement discretion — nuts and coronary heart disease. US Food and Drug Administration website. http://www.fda.gov/Food/IngredientsPackagingLabeling/LabelingNutrition/ucm072926.htm. Updated July 9, 2015. 13. O'Neil CE, Fulgoni VL 3rd, Nicklas TA. Tree nut consumption is associated with better adiposity measures and cardiovascular and metabolic syndrome health risk factors in U.S. Adults: NHANES 2005-2010. Nutr J. 2015;14:64. 14. Novotny JA, Gebauer SK, Baer DJ. Discrepancy between the Atwater factor predicted and empirically measured energy values of almonds in human diets. Am J Clin Nutr. 2012;96(2):296-301. 15. Baer DJ, Gebauer SK, Novotny JA. Measured energy value of pistachios in the human diet. Br J Nutr. 2012;107(1):120-125. 16. Baer DJ, Gebauer SK, Novotny JA. Walnuts consumed by healthy adults provide less available energy than predicted by the Atwater factors. J Nutr. 2016;146(1):9-13. 17. Jenkins DJ, Kendall CW, Marchie A, et al. Direct comparison of a dietary portfolio of cholesterol-lowering foods with a statin in hypercholesterolemic participants. Am J Clin Nutr. 2005;81(2):380-387. 18. Thomson CD, Chisholm A, McLachlan SK, Campbell JM. Brazil nuts: an effective way to improve selenium status. Am J Clin Nutr. 2008;87(2):379-384. 19. Hemshekhar M, Santhosh M, Kemparaju K, Girish KS. Emerging roles of anacardic acid and its derivatives: a pharmacological overview. Basic Clin Pharmacol Toxicol. 2012;110(2):122-132. 20. Tedong L, Madiraju P, Martineau LC, et al. Hydro-ethanolic extract of cashew tree (Anacardium occidentale) nut and its principal compound, anacardic acid, stimulate glucose uptake in C2C12 muscle cells. Mol Nutr Food Res. 2010;54(12):1753-1762. 21. Rodriguez-Leyva D, Dupasquier CM, McCullough R, Pierce GN. The cardiovascular effects of flaxseed and its omega-3 fatty acid, alpha-linolenic acid. Can J Cardiol. 2010;26(9):489-496. 22. Lowcock EC, Cotterchio M, Boucher BA. Consumption of flaxseed, a rich source of lignans, is associated with reduced breast cancer risk. Cancer Causes Control. 2013;24(4):813-816. 23. Hudthagosol C, Haddad EH, McCarthy K, Wang P, Oda K, Sabaté J. Pecans acutely increase plasma postprandial antioxidant capacity and catechins and decrease LDL oxidation in humans. J Nutr. 2011;141(1):56-62. 24. Jiang Q. Natural forms of vitamin E: metabolism, antioxidant, and anti-inflammatory activities and the role in disease prevention and therapy. Free Radic Biol Med. 2014;72:76-90. 25. Bolling BW, Chen CY, McKay DL, Blumberg JB. Tree nut phytochemicals: composition, antioxidant capacity, bioactivity, impact factors. A systematic review of almonds, Brazils, cashews, hazelnuts, macadamias, pecans, pine nuts, pistachios and walnuts. Nutr Res Rev. 2011;24(2):244-275. 26. Kennedy-Hagan K, Painter JE, Honselman C, Halvorson A, Rhodes K, Skwir K. The effect of pistachio shells as a visual cue in reducing caloric consumption. Appetite. 2011;57(2):418-420. 27. Honselman CS, Painter JE, Kennedy-Hagan KJ, et al. In-shell pistachio nuts reduce caloric intake compared to shelled nuts. Appetite. 2011;57(2):414-417. 28. Phillips KM, Ruggio DM, Ashraf-Khorassani M. Phytosterol composition of nuts and seeds commonly consumed in the United States. J Agric Food Chem. 2005;53(24):9436-9445. 29. Sicherer SH, Muñoz-Furlong A, Godbold JH, Sampson HA. US prevalence of self-reported peanut, tree nut, and sesame allergy: 11-year follow-up. J Allergy Clin Immunol. 2010;125(6):1322-1326. 30. Mishra N, Dubey A, Mishra R, Barik N. Study on antioxidant activity of common dry fruits. Food Chem Toxicol. 2010;48(12):3316-3320. 31. Bolling BW, McKay DL, Blumberg JB. The phytochemical composition and antioxidant actions of tree nuts. Asia Pac J Clin Nutr. 2010;19(1):117-123. 32. Arab L, Ang A. A cross sectional study of the association between walnut consumption and cognitive function among adult US populations represented in NHANES. J Nutr Health Aging. 2015;19(3):284-290. 33. Hardman WE. Diet components can suppress inflammation and reduce cancer risk. Nutr Res Pract. 2014;8(3):233-240.